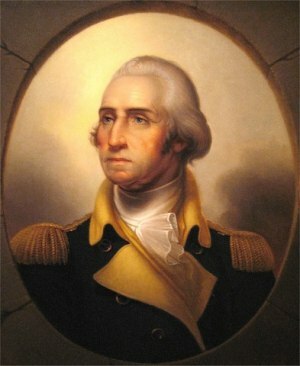 George Washington became known as "The Father of Our Country". He is an important person in the history of the United States. George's great-grandfather came from England and became a landowner in America. He owned more than 5,000 acres of land. George's father, Augustine, settled in Westmoreland County, Virginia. This is where George was born to Augustine and his second wife, Mary Ball. They had five more children after George was born. He only went to school for 7 or 8 years, and his favorite subject was arithmetic. His father died when he was 11, and he helped his mother take care of the plantation. * He grew very tall; 6 feet and 2 inches, and he liked to show how far he could throw rocks. When he was sixteen he went to live with his half brother, Lawrence, who had inherited Mount Vernon from their father. Later on George would inherit the estate from Lawrence since Lawrence did not have any surviving children. George married a widow,* Martha Custis. They never had children of their own, but they raised Martha's two children, John Parke Custis, who was called "Jacky", and Martha "Patsy" Custis. Then after Jacky's death in the war, they adopted two of his children, their grandchildren. Men came to Philadelphia to meet with the First Continental Congress. 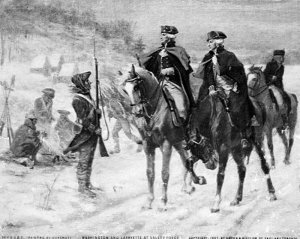 Washington thought he would be a good man to be general of the army, so he showed up in a uniform he had designed himself. The men agreed he would be the best person for the job. The people of America wanted to be free of the rule of England and fought for that freedom. Washington was a good general. At one time Congress could not pay the soldiers and the soldiers started to rebel. The general spoke to them about the need to keep fighting and he said he himself would accept no pay until the war was won. The soldiers began to cry and there was no talk of mutiny* after that day. Washington was always trying to become a better person. He worked to learn how to write neatly so people could read his writing easily. To improve his manners, he copied 110 rules or sayings written by a French priest. One of his favorites was: "When walking with a great man, don't walk right beside him, but somewhat behind. Stay close enough that he may speak easily to you." The people wanted to make him king, but he thought the country needed a different kind of government. They elected him president in 1789. He received a unanimous* vote by the men who were doing the electing. Every one of them voted for him. He served for two terms; 8 years, as president. The people wanted him to run for a third term, but he said, "No", and went back to the plantation. He later returned and became Commander in Chief of the Army. In 1799 he became ill with a sore throat. The doctors in those days did not know how to treat an illness, and some think their treatment caused his death. 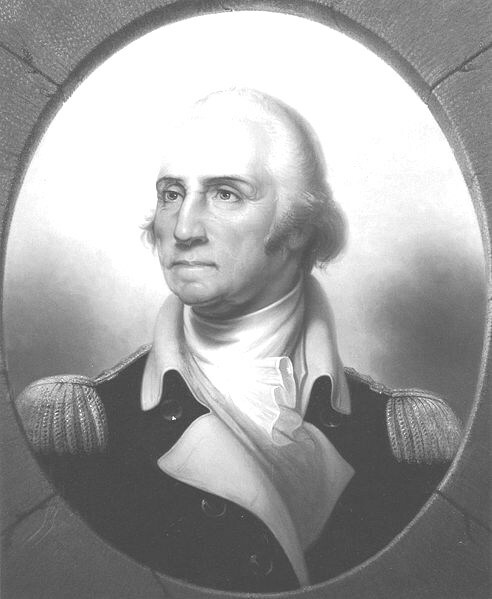 It is said of Washington he was "First in war, first in peace, and first in the hearts of his countrymen". Listen to stories about this president. At biography.com search for George Washington. Press "Go" to search for books about George Washington. Photograph of Washington portrait by Rembrandt Peale taken by my son Elton Smith. The President of the United States is both an honor and considered one of the world's most powerful people. <a href="www.theuspresidents.org/all-presidents-in-order/">The US Presidents List</a> responsibilities include being the commander-in-chief of the military and leading the nation with the largest economy. Great site! I recommend moving the Williamsburg link down the page and featuring the MountVernon.org website in a more prominent position. hello I was wondering if george washington had a favorite book or quote? This page displayed 878,812 times.